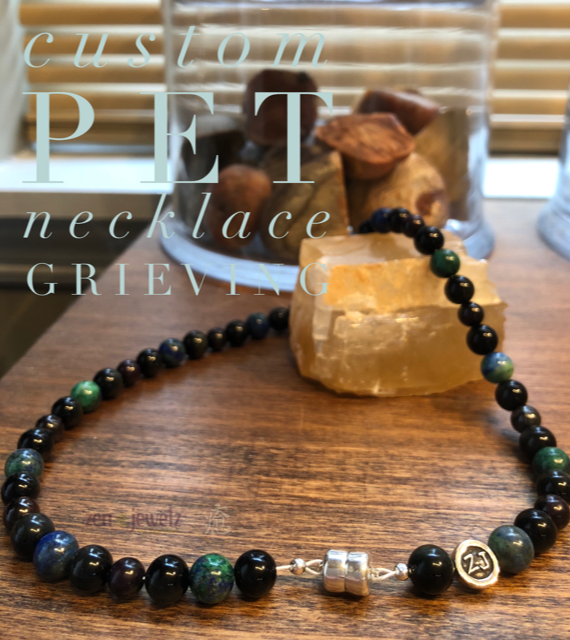 Client requested a custom zen pet necklace for her dog Eloise. Here's what she said "Ever since her dog Pumpkin died, Eloise seems a bit lost. She's very nervous, having lots of accidents - I think she's just desperately lonely and upset. I'd like some stones suggestions. I believe she will wear the necklace proudly." I suggested a grieving necklace, made of Rainbow Obsidian, Sugilite and Azurite. We used a heavy duty break away magnetic clasp for safety quick release.